assistance of the London Design Centre in 1962 to suggest unique body shapes for future Vox guitar models. Through these efforts the iconic shapes of the original Vox "Teardrop" and "Phantom" guitars were developed. Vox again revived these body styles in 2013 with their Apache Series Travel Basses. Travel Guitars - The concept of "travel guitars" gained popularity in the 1990s. Travel guitars were typically acoustic guitars with small bodies and short scale necks that could be carried in a back pack or stored in the overhead luggage bin of an airplane. The Vox Apache Series guitars and basses took the concept of the travel guitar into a totally new direction. The Vox Apache guitars and basses were electrified. They combined the .7 watt battery operated amplifier circuitry originally designed for the Vox AC1RV into the instrument. 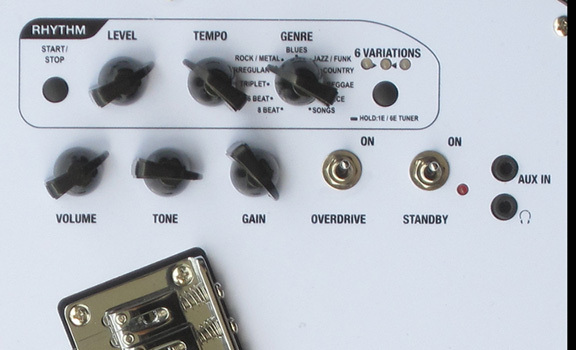 Volume, Tone and Gain controls plus an Overdrive toggle switch adjusted the level and tone of the guitar. A Standby switch muted the output of the amplifier. The output signal from the internal amplifier was routed either to two 3" speakers located on the pick guard or to the head phone jack. The head phone jack muted the speaker when used. Rhythm (Drum) Machine - Vox carried the innovative spirit of the Apache instruments to an even higher level by adding an internal "drum machine" to the guitars and basses. Six variations of eleven drum styles provided a total of sixty-six rhythm patterns. Separate rotary controls adjusted the tempo and level of the percussion. E-String Tuner - A built-in E-string tuner with "sharp", "flat" and "in tune" LED lamps was installed on the pick guard. Aux In Jack - An "Aux In" jack located on the pick guard allowed an MP3 player to be connected to the internal amplifier of the guitar. Battery Power - The Apache 1 guitar operates up to 26 hours on six AA batteries. 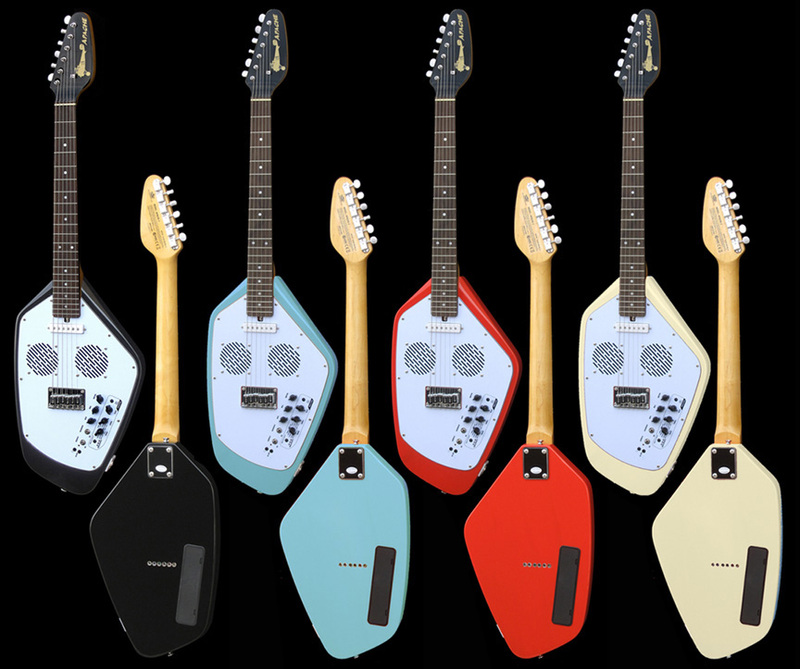 Body and Neck - The basswood body of the Apache 2 was available in four finishes: salmon red, black, seafoam and white. The 24" scale, 22 fret bolt-on neck included an adjustable truss rod. The necks were made from hard maple finished in natural amber. The finger board was rosewood. The guitars were factory equipped with .010” - .045" round wound strings. Hardware - The Apache 1 and 2 guitars both featured chrome plated vintage style tuners, a chrome plated four-way adjustable six saddle bridge and chrome strap buttons. A single coil pickup was located in the "neck" position. The output from the pickup was directed to both the internal .7 watt battery operated amplifier and to a standard 1/4" output jack. Accessories - A gig bag, strap, and batteries are included with the Apache guitars and basses.